Good morning! 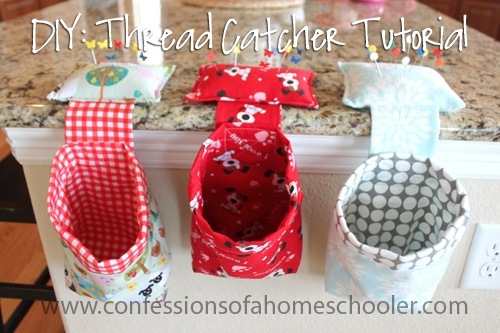 I hope you are all ready for a home economics lesson today because I’m sharing a tutorial for an easy thread catcher. 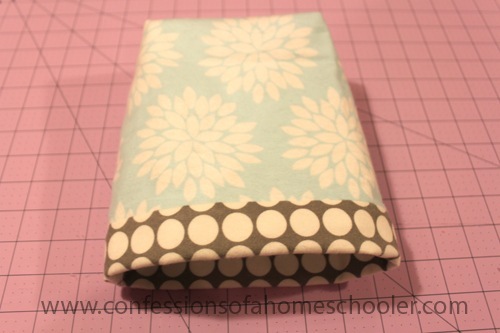 My girls each made one for their new sewing machines and I made one too! So what is a thread catcher? It’s basically a super cute trash can with a weighted pin cushion on top. These hang nicely by your sewing machine and come in very handy when it comes to keeping little pieces of thread, fabric contained. 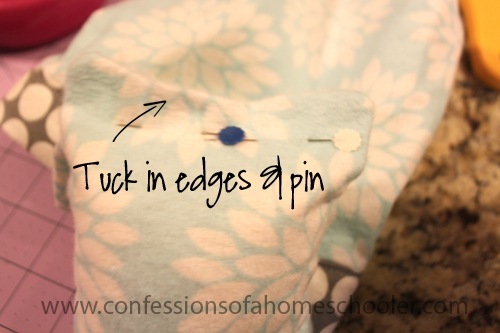 Plus you can quickly access your pins while sewing too. And who doesn’t need a cute little trashcan in their sewing room? This post got a tad long, but I wanted to give you as many details as I could. By the way, this is a great project for younger sewers! 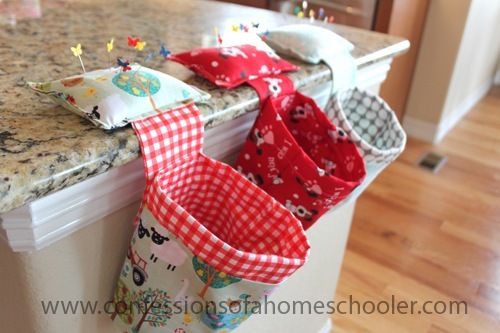 My girls (9 and 11) each made their own bags. 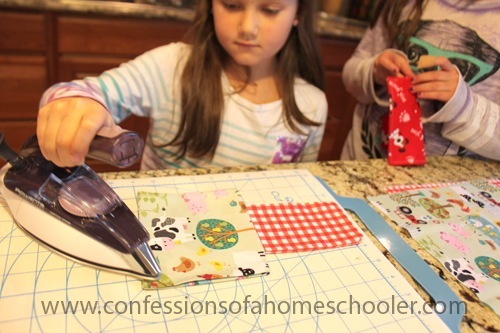 I did cut the fabric for them, but they did the rest all on their own. Sound like fun? Let’s get started! 1/2” x 18” of any type of stabilizer for the top edge of the bag. 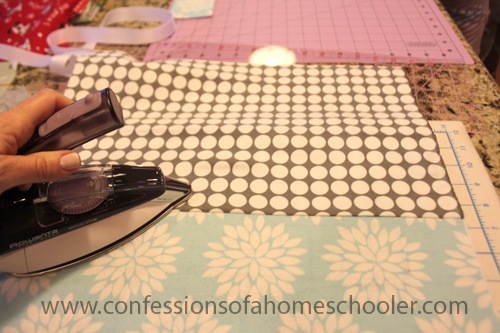 I used a cotton belting similar to this one from JoAnn’s, but you can use plastic or anything else you have on hand that will give it some stability. 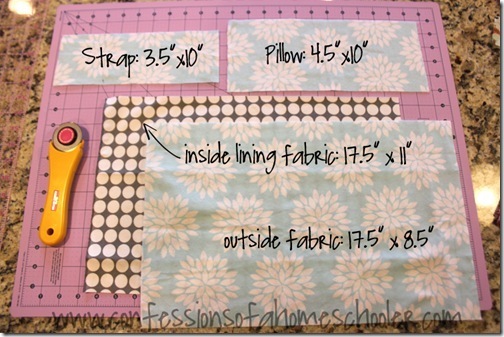 All seems are sewn at 1/4” unless otherwise indicated. 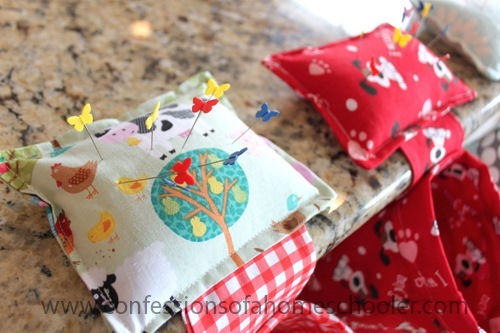 The first step is to create the strap that holds the pin cushion to the bag. To do this simply fold the strap piece in half length wise with the right sides together, so your piece measures 3.5” x 5”. 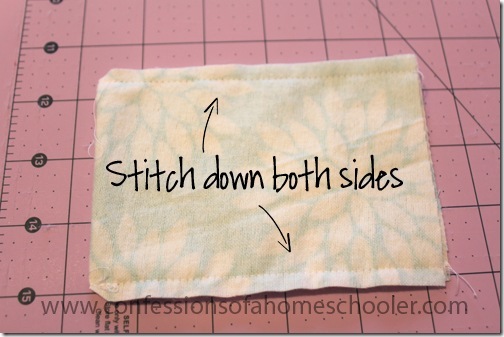 Sew down both sides using a 1/4” seam. 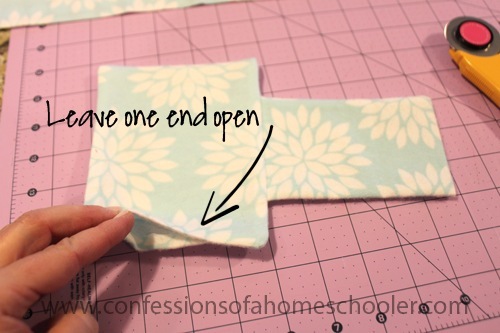 Make sure to leave one end open. Turn the strap right sides out and push out the corners with a pencil, or your scissor tip. 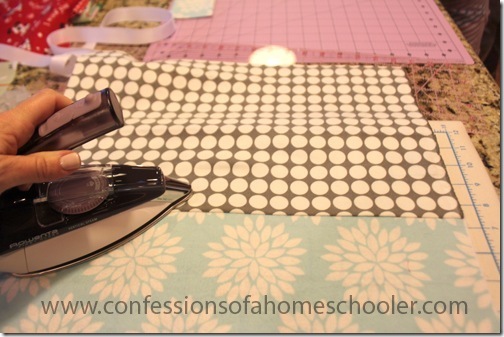 Just be careful not to cut your fabric! 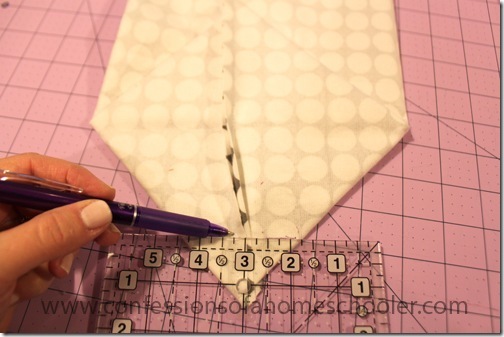 Next lay the strap you just created on the piece of pillow fabric as shown below. 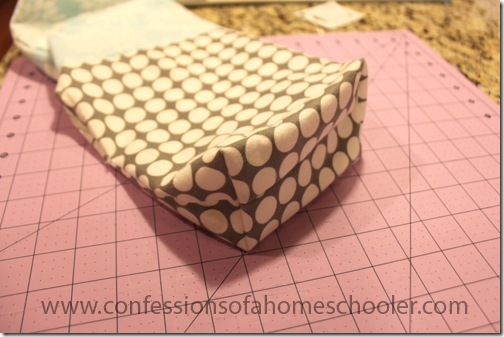 Fold the pillow fabric right sides together in half so it measures 4.5”x 5”. 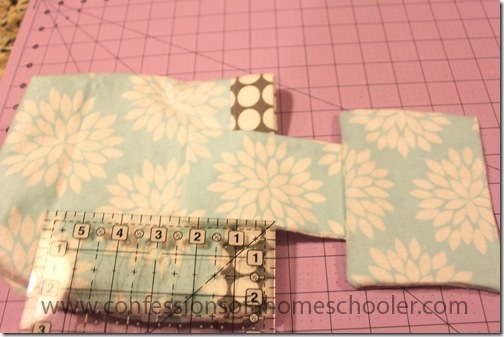 Adjust the strap so it’s centered on the pillow. 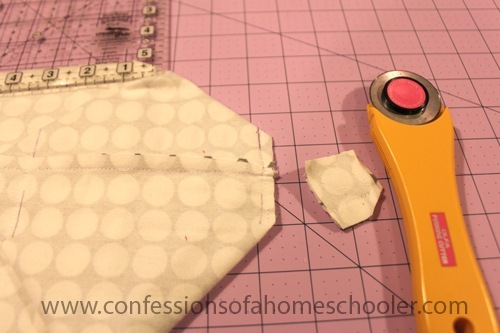 Pin all of the layers together. 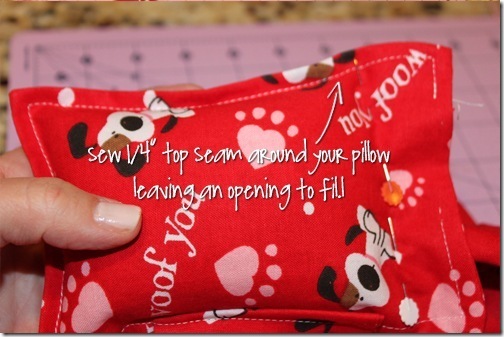 Stitch down both sides, and about a 1/2” in on each end, but make sure to leave an opening in the end so you can turn your pillow right sides out and fill! When stitching, make sure to catch your strap in the bottom seam (shown below), but fold down your strap so you do NOT stitch your strap in the top seam. Take a quick minute to press your pillow and strap. We also tucked the pillow opening seam in to make sewing it up a little easier. 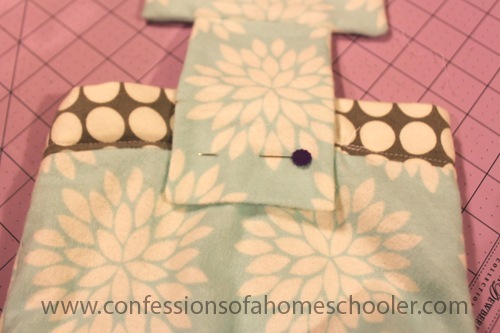 If you’d like, do a 1/4” top stitch around the outside of the pillow edge to give it a more finished look. 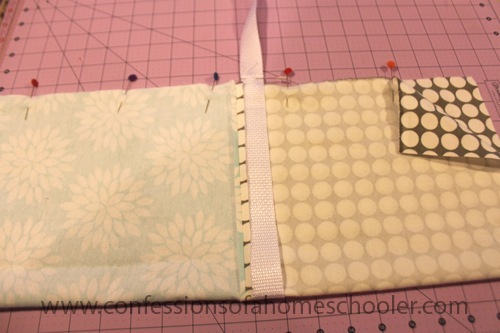 This is a picture of my daughter’s project, I forgot to top stitch my pillow Again, make sure to leave one end open to fill! 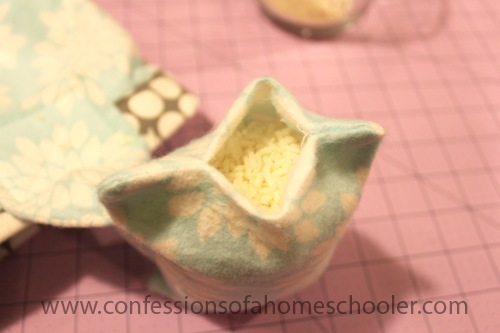 Next fill your pillow with either rice, sand, or crushed walnut shells. Then tuck in your edges and top stitch to close the seam. 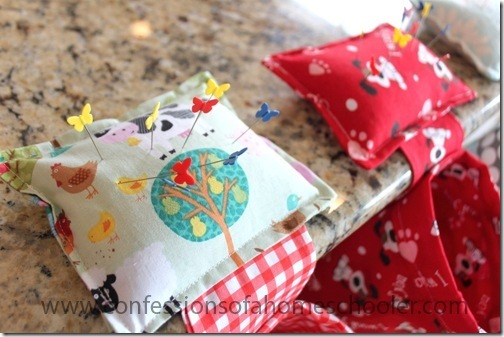 This is much less noticeable if you top stitch like I did in my daughter’s project shown above. Set your completed pillow and strap aside. 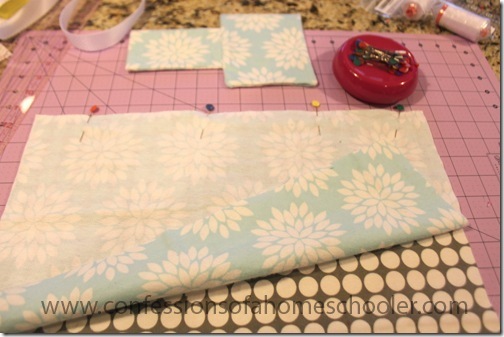 Next pin your lining and outside bag fabric right sides together along the 17.5” sides and pin. Sew together with 1/4” seam. 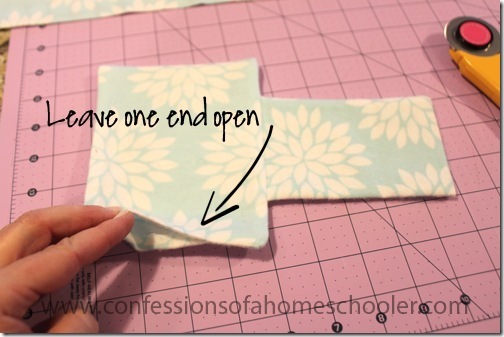 Press your seam open so that you have a nice edge. 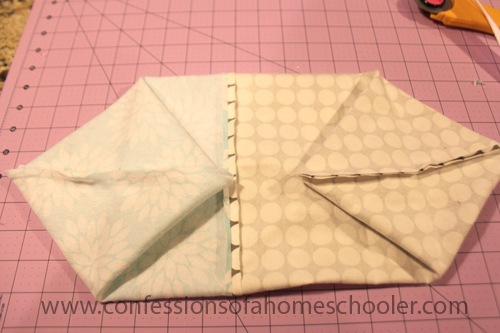 Next turn your project sideways and fold in half like shown below. Pin along the edge and add in the stabilizer for the bag rim so it goes all the way around the project as well. Line it up so it’s just along the seam of the inside lining as shown below and pin in place. 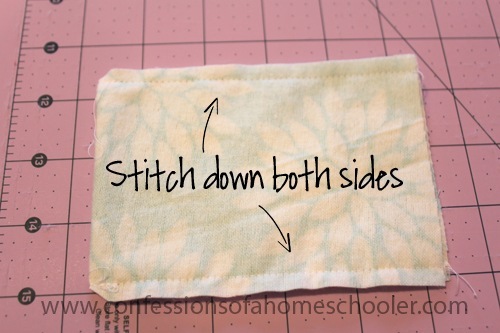 Stitch around all three sides as shown below, making sure to catch the stabilizer in your seam. 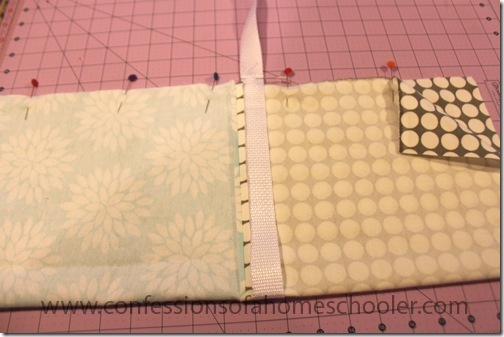 Trim the stabilizer off even with your bag fabric when done sewing. Make sure to leave about 3” at one end open so you can turn the bag. 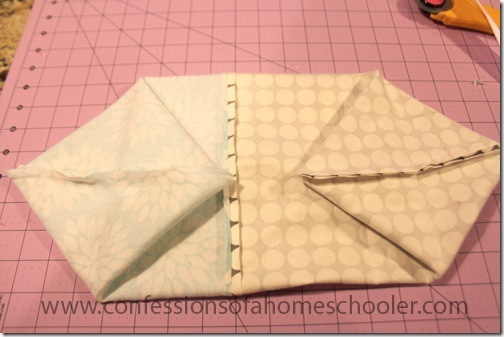 Next fold your ends like shown below. Mark about 1.5” up from each corner tip and sew along your line. This will create a box look on the bottom of your bag. 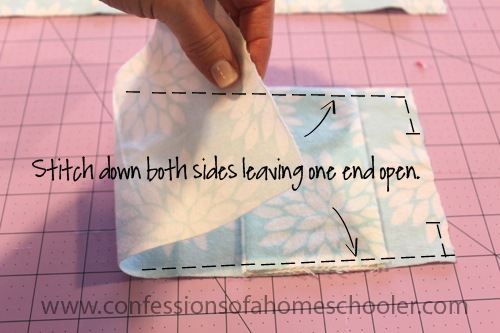 Do this on both tips of your outside and lining fabric. 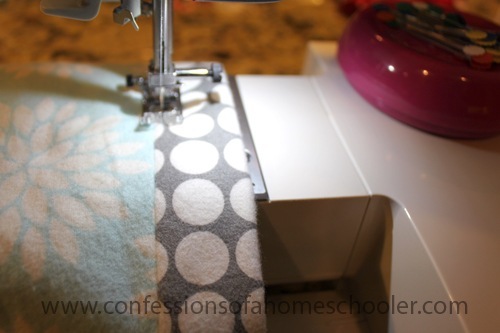 After you’ve sewn along your line, trim off any excess fabric like below. Next turn your bag right side out and stitch up the end seam to finish it off. Tuck your inside lining down into your bag so it should look something like this, with about an inch of your inside lining showing along the top edge. Next run a quick top stitch around the edge just to keep the lining and stabilizer strip in place. 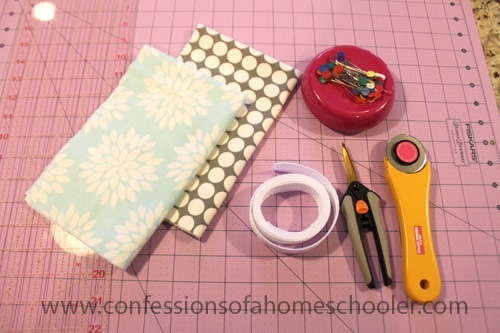 Adding your strap to your bag is the last step in completing your project! 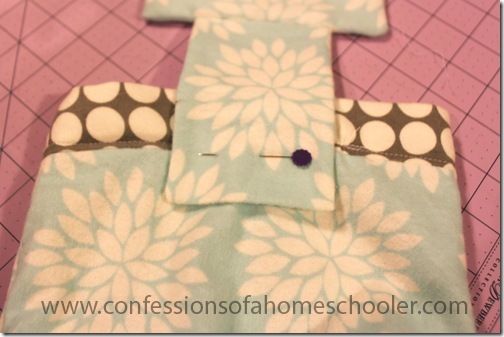 Place your strap along the center backside of your project about 2.5” down and pin in place. Just make sure you only pin it to one side of your bag, and not both sides or your bag won’t open when you’re done! I just stitched a square around the strap and then an “X” inside to make it a little bit more secure. And that’s it! This project took us about an hour and turned out really cute! Now go and make some more because they’re fun! Oh and don’t forget to get some fun pins to add to your cushion. No sewer is complete without a cute set of pins. Then it’s time to put your new bag to use! 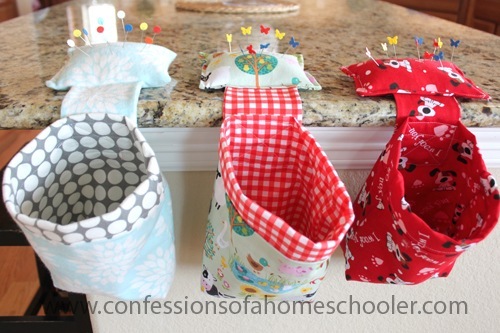 Any small scraps, threads, bits, and bobs can go in here. 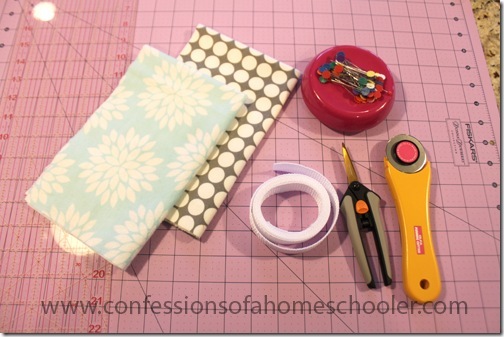 I hope you enjoyed this tutorial and happy sewing! No way! Not 10 minutes ago I posted the ones I made for my girls on Instagram. I check my e-mail and what do I see, a FREE tutorial from you. LOL I purchased a tutorial on Etsy. Hmmm, had I known you had a one in the works for free I would have waited! LOL Those look so cute!! Yes, yes… absolutely. I’m all about supporting the “little guy”! They get my business first! Please forgive me for asking this .. But i was wondering what shade your polish was ??? It’s such a pretty color for spring . It’s called “Ballet Slippers” by Essie and I love the color! 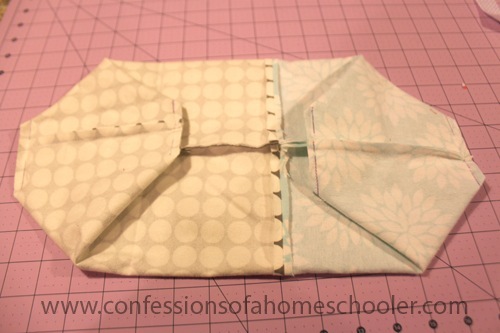 Thank you so much for offering this pattern for free. I have been looking for such a pattern for a while. I just made one of these. It turned out well. Thanks for the helpful tutorial. thanks ! 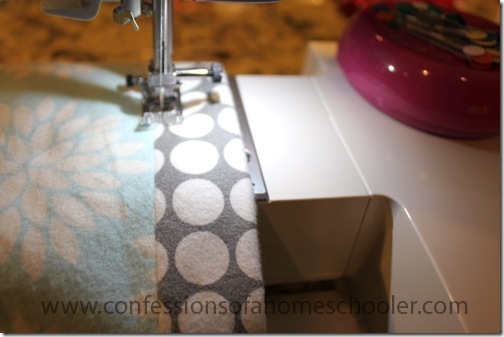 i’m new at sewing and really appreciate this. i have cats that crawl on my sewing table. The word no .. doesn’t apply to cats.. ( so they think.. ) but this will help make sure there’s no loose pins for the to find. Quick question. 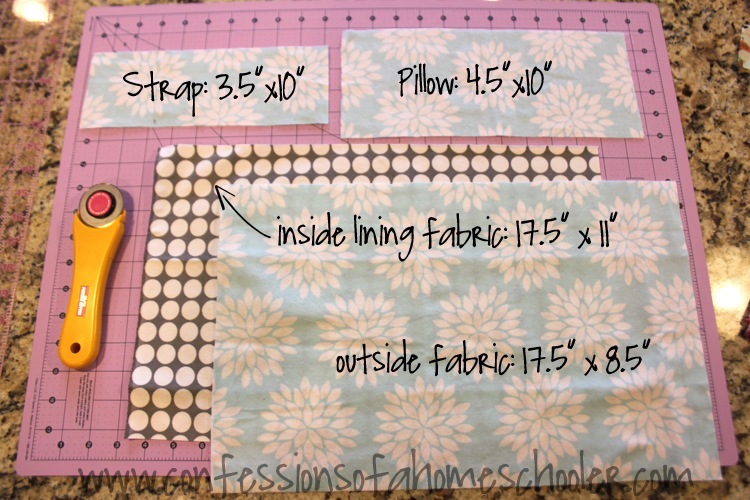 In your materials list you list 1/2″ cotton belting, but the link that you have to Jo-Ann’s is one and a half inches. Were you meaning the larger or smaller size. 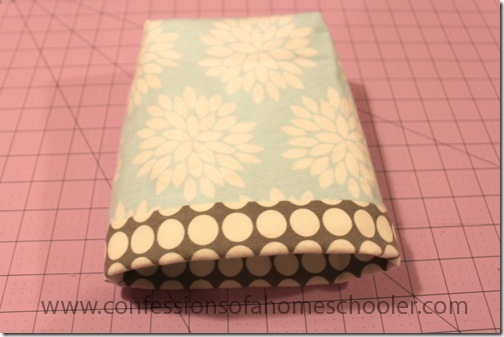 I made one last night and used 1 1/4″ because it is what I found, turned out looking great! Did you use flannel? If so is it a must? If not is it jus cotton like for a quilt? I used flannel, my daughters used regular quilting cotton. I think overall theirs has held up a lot better than mine. My flannel on my pin cushion has started to tear over time and use. 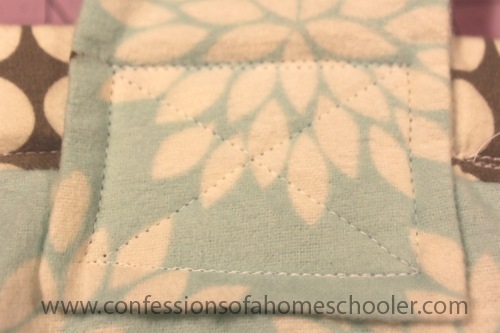 I think the flannel is a bit too soft, so I would probably use quilting cotton if I ever make another one.